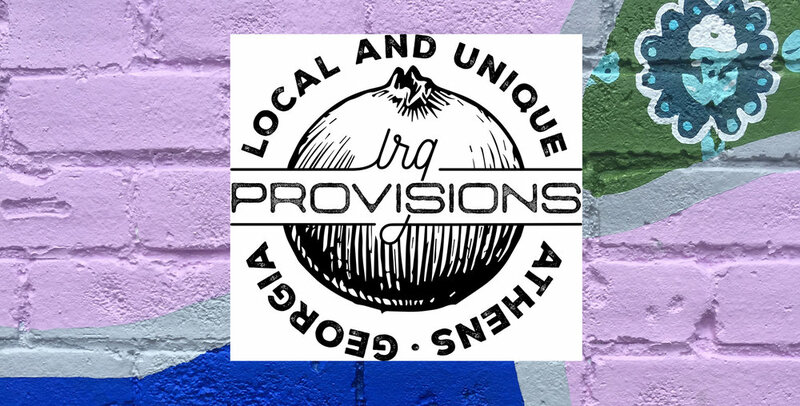 Athens artist Vivian Liddell has designed and executed two related murals for LRG Provisions in Five Points. The main mural is an abstract design on the exterior wall of the building. A smaller, altered slice of the exterior mural can be viewed on an interior wall in the back of the dining room. The diverse color palette and playful forms of the exterior mural draw from neighboring structures and the immediate environment; several shapes of phthalo turquoise echo Avid Bookstore’s façade across the street. Frequent viewers will be rewarded as they discover the mural’s anamorphic features, such as architectural lines from the front and roof of the building that appear to continue into the mural when seen from specific vantage points. And although something more than shapes and colors is being depicted, it may take a few passes to decipher this very abstract take on a familiar subject. Liddell requested community input at the beginning of the process by asking for image submissions of beloved kitchens. Using this feedback, her own photographs (one portion of the mural contains imagery based on her mother’s kitchen wallpaper from the 1980’s), and online research, she chose patterns that represented a wide range of time periods and décor. By abstracting these found patterns and reframing them in a more contemporary gestural structure, the finished design evokes a digital landscape that still manages to be nostalgic through the specificity of color. A reception for the mural unveiling will be held from 5 to 7 pm on Sunday, July 22nd with complimentary beer, wine and light snacks. LRG Provisions is a cozy neighborhood restaurant located in the Five Points community of Athens, Georgia. They are open for dinner six nights a week and Sunday brunch. More information is available at http://lrgprovisions.com.